Many, many Christmases back, for reasons too many to enumerate, I became a grinch. These days, the total triumph of commercialism over any other aspect of the holidays aggravates me more than anything else about the season. And in the ever-growing lump in my craw, the Thanksgiving-Hanukah-Christmas-New Year’s Eve superabundance of wine hype and what comes very close to wine scamming holds an uncomfortably large place. As I’m sure no one reading this post needs to be told, wine appropriately forms a part of any festive occasion, and the conjunction of those occasions at this time of year rightly makes us aware of wine’s important role at the table. Wine advertising and wine publicity are prone to – shall we say lushness? (pun intended) – at all times, but for the past month-and-a-half to two months they have run amok. The gullible consumer – and that includes all of us, at one time or another – could be excused for thinking there is no such thing on the American market as an ordinary wine, or a wine unbemedalled or less than 95-pointed. 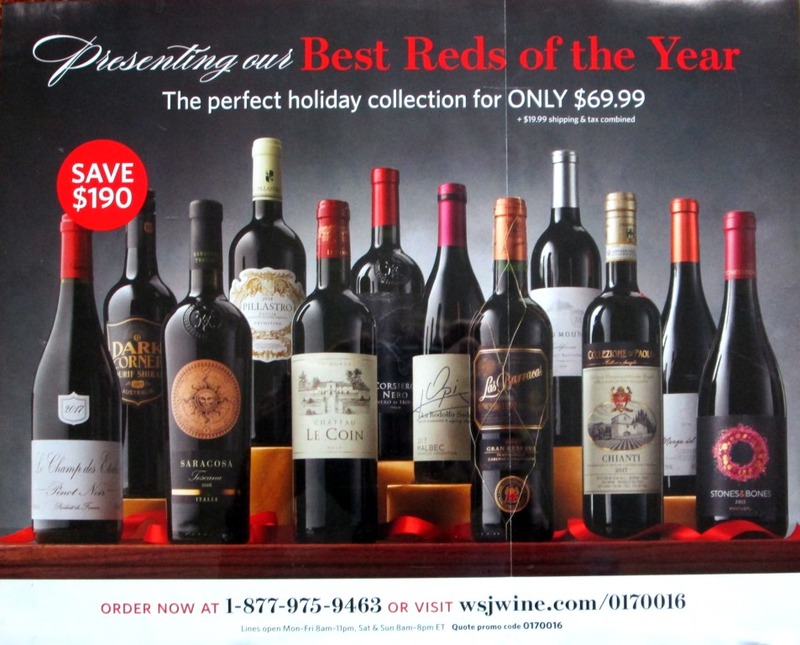 For me, the most outrageous of these hypes are those that try to snare the unwary and seasonally-softened-up shopper into not just a single holiday purchase or two but a long-term commitment: wine clubs. Wine clubs should be a good deal for consumers. Their purchasing power ought to give them some leverage in keeping prices down, and their numbers ought to enable them to thin their margins and still show a profit. Their access to expertise ought to enable them to select really interesting wines that would allow their members to experience many different types. The whole enterprise ought to be helpful, enjoyable, and educational for novice wine drinkers and for those who enjoy good wine but don’t – understandably – want to undertake a whole apprenticeship in it. The reality, it seems to me, is far from that. Prices are fixed at an arbitrary level, and choices seem pitched to wines and names that consumers will already feel comfortable with. I see no evidence that the selections ever go any further. I might be wrong about that – I don’t have a research team to investigate all wine clubs – but so far I’ve seen no evidence of serious educational, palate-broadening focus. I offer WSJWine as an example of all this. I’ve pilloried it once before, and nevertheless it persisted. I have no particular onus against it. But it’s important. First of all, it bears the name of The Wall Street Journal, with all the prestige that carries – though a moment’s thought will tell you that WSJ’s business acumen doesn’t guarantee expertise in any other areas: I find many of its editorial positions deplorable, for instance. 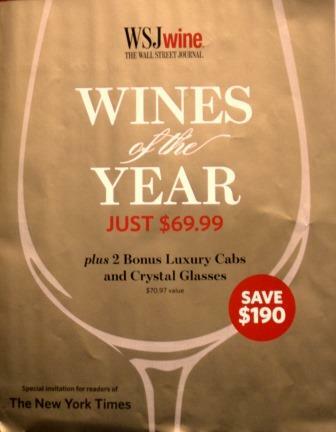 But when you discover, as I did, a fancy gold-paper, special offer of “The Wines of the Year for readers of The New York Times” tucked into one of the pre-Christmas issues of your daily newspaper, it kinda catches your eye. The Wall Street Journal and The New York Times: that’s pretty big league, isn’t it? They should know about wine, shouldn’t they? Well, no: Their wine columnists may know a great deal about wine, but there is no indication that those people have anything to do with the wine club or its selections. Thus appeareth the first – and a major – misdirection. Overwhelmed? You’re supposed to be – so much so that you don’t ask who or what awarded all those points and medals. Good thing too, ‘cause they don’t tell you. Would you invest in a stock on the basis of hype like that? I doubt it. A Bordeaux: just that, simply Bordeaux, which is the lowest common denominator of all of the Bordeaux region’s many appellations, made by the tank-truck-full from grapes from all over the very large zone. A so-called Super Tuscan, an IGT wine of no particular distinction (it retails for about $19) made from unspecified grapes (probably some Sangiovese, plus ?) from anywhere in Tuscany. A “Portuguese Gem” that retails for $10 or $11, from a maker of box wines. A “Spanish Blockbuster” that retails in the $10-$11 dollar range. Those last two items ought to make clear that these are not bargain prices the wine club is offering – in many cases, far from it. In fact, the leaflet’s claim that its $70 special offer represents a real value of $260 is an assertion worthy of the present US president. I could go on through every single one of these wines, with similar sorts of deflation of their descriptions, but you get the point. These are the “Best Reds of the Year”? Once again, far from it. What I fear most is that the poor deluded souls who taste these wines believing that claim will simply conclude that, if this is great stuff, then they just don’t get wine: End of story. And that’s perhaps even worse than the deceitfulness of the claims themselves: the potential wine lovers lost, and their loss of lifetime of pleasure. My apologies for the negative cast of this post, but I find this kind of thing offensive. I’ve written about things like this before; as I said above, nevertheless, they persisted. 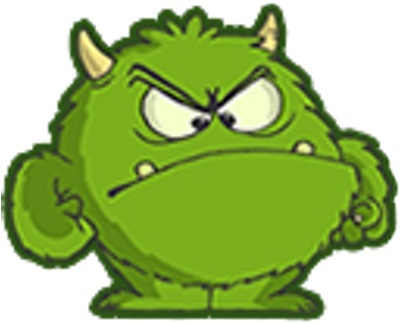 I try to sit on my grinchitude during the holiday season so as not to spoil everybody else’s fun, but the holidays are behind us now, and I need to vent about some of the vinous irritations of the past . . . is it only a few weeks? Seems like an eternity to me. Bah Humbug! Almost everyone who tastes Custoza, Lugana, and Soave regards them as charming and enjoyable wines. What isn’t immediately evident is that they aren’t simply drink’em-quick-and-young types but are capable of aging – Custoza for minimally three years; Lugana for five, six, or more; and Soave for ten, or considerably more. I don’t mean just survival here, but serious bottle development: All three grow deeper, more intense, and more complex with age. Remaining charming and enjoyable, they become much more impressive. Despite the dismissive myths, Italy has many white wines that can age as well and gracefully as Burgundies, and it’s time people started talking about them. The Custoza zone lies on both banks of the Mincio river, at the southeastern corner of Lake Garda. It’s a small DOC zone, about 1500 hectares, with a nevertheless varied production – Bianco, Bianco Superiore, Spumante (Metodo Classico or Charmat method), and Passito. All are popular in Italy. I’m mostly concerned with the Bianco and Superiore, which are the bulk of the production. 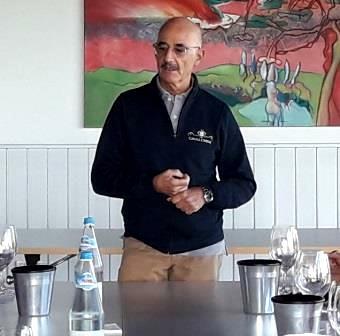 On a recent visit to the region hosted by the Vignaioli Veneti (see preceding post), our group visited two Custoza producers, Cavalchina and Monte del Fra, quite different from each other. That’s because the DOC regulations are generous: The wine may include Trebbiano Toscano, Garganega, Trebbianello (a clone of Friulano), Fernanda (a clone of Cortese), and even some Chardonnay, Malvasia, Incrocia Manzoni, Pinot Bianco, and/or Riesling Italico. Both wineries make a very sound basic Custoza and a more complex Superiore. 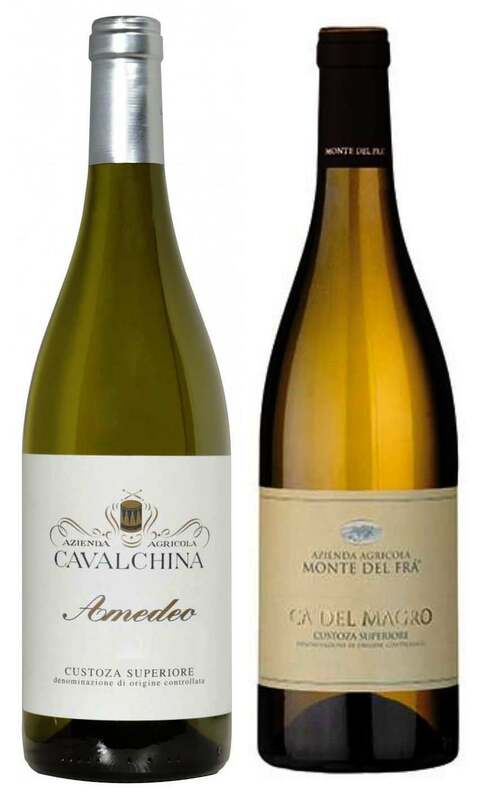 Cavalchina’s Superiore, called Amadeo, blends 40% Garganega with 30% Fernanda, 15% Trebbianello, and 15% Trebbiano Toscano to produce a wine of marked minerality and lively acidity wedded to a palate-pleasing softness. The 2009 bottle with which the tasting opened gave ample proof of Custoza’s ability to age: It had a beautiful aroma of mace and nutmeg and May Wine spices, followed by an equally lovely spice-and-white-fruits palate, all still fresh and live. Monte del Fra’s Superiore, called Ca del Magro, started from the same 40% Garganega, then went a different direction with 20% Trebbiano Toscano, 10% Fernanda, 10% Chardonnay/Riesling Italico/Malvasia, and 20% Incrocia Manzoni. This blend, in the 2014 vintage, yielded a wine of great roundness and balance, with the slightest suggestion of sweetness within its minerality. These flavors intensified and dried in 2013 and 2012 bottles, culminating in an utterly voluptuous 2009, seemingly just reaching its peak. The Lugana zone borders Custoza to the west, at the foot of Lake Garda. Not much bigger than Custoza – about 1800 hectares of vines –it presents a very different varietal situation. 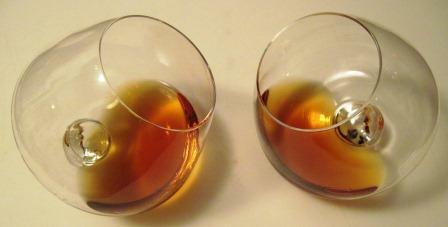 Turbiano (related to Verdichio) accounts for 90% – often 100% – of the finished wine. 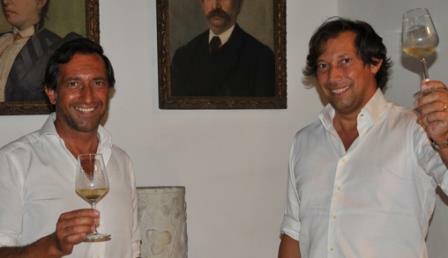 The Otella winery, owned by Michele Montresor and his brother Francesco, produces three labels of Lugana, all 100% Turbiano. The basic bottling, simply labeled Lugana, has a pleasing white fruit and flower nose with a delightful herby/flinty palate, distinctive and enjoyable. The cru wine, Le Crete, is named for its white clay soils, and presents as leaner and more muscular, while sharing the same marked flavor profile. Otella’s Riserva, Molceo, ages for 16 months on the lees and intensifies the characteristics of its siblings. The oldest bottle we tasted, a 2007, was quite impressive – beautifully structured, with all the herbal/flinty notes heightened, and still at 10 years old fresh and lively. Again, a beautiful example of how well these too-little-known and vastly undervalued wines mature. 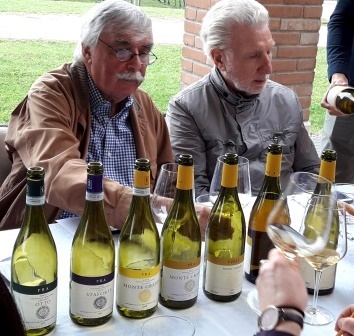 The other Lugana estate we visited, Le Morette, began life 60 years ago as a nursery for vines, and cultivating its own was an almost inevitable offshoot (sorry!) of that. Le Morette also produces three different bottlings: We tasted the current vintage and an older vintage of each. The basic wine, called Lugana Mandolara 2016, had a very Soave-like nose and palate, strongly mineral and very pleasant. Its older sibling, a 2012, showed more herbal scents and palate, suggesting Vermentino – quite intriguing. Lugana Benedictus 2015 showed a bit more intensity and complexity, while still as easy drinking and enjoyable. It is a selection from older vines, harvested slightly later than Mandolara. The 2007 bottling showed dramatic evolution, with a slightly smoky, slightly botrytis nose, and on the palate a merging of Riesling and Sauvignon-ish characteristics – very, very interesting. The Soave Classico zone lies east and upland of Lake Garda, with its vineyards at usually higher elevations than either Custoza or Lugana. All three of these zones have soils of volcanic origin, but these are most prominent in the Soave Classico. We visited Ca Rugate, Pra, and Pieropan, all highly esteemed – indeed, among the most prestigious – producers of Soave Classico. The Soave Classico DOCG requires a minimum of 70% Garganega, with the balance made up of Chardonnay and/or Trebbiano di Soave. Most of the best producers use 100% Garganega for at least one of their wines, but all prize the native Trebbiano di Soave, and none of the best producers use Chardonnay at all. Ca Rugate’s basic bottling, San Michele, vinified entirely in stainless steel, showed great typicity and modest minerality, a completely enjoyable everyday wine. Monte Fiorentine, a cru bottling from 50-year-old vines, and also 100% Garganega, had a fine chalky, mineral nose and a palate of white fruits and dry stones in the 2016 vintage, while the 2010 showed a beautifully evolved metallic/mineral nose and a palate of apples, pears, chalk, and flint. This seven-year-old was our first indication of just how well Soave Classico can age. Ca Rugate also makes an IGT wine, Studio, from 60% Trebbiano di Soave and 40% Garganega, a very interesting wine. The 2016 we tasted is, I think, still at the experimental stage – but it may develop very well with more bottle aging. Pra has long been one of my favorite Soave producers: Its basic bottling, Otto, is more or less my house Soave. The 2016 we tasted was quite classic, fresh and fine with racy minerality, vinified from 100% Garganega. The 2015 Staforte showed extremely well, with great intensity and vivacity. Again 100% Garganega, Staforte is a selection of grapes from the best crus, with long maceration on the lees. Just a beautiful wine. 2014 Colle Sant’Antonio was vinified from slightly dried grapes to yield a wine slightly rounder and fuller than conventional Soave: I enjoyed it, but thought it needed a good deal more bottle age. We then tasted the wine from Pra’s Monte Grande, a very steep vineyard planted roughly in 70% Garganega and 30% Trebbiano di Soave. This was a stunning vertical – 2001, 2003, 2007, 2011, and 2016. These were lovely wines, mouth-filling and persistent, all fresh and vigorous, with classic minerality and white fruits on the palate. I like mature wines, so for me the 2001 was outstanding, a wine that can stand on the table with any Chablis Grand Cru of the same age. The murmurs of appreciation around the table for each of these wines were very audible, and deservedly so. Good as these wines were, our final Soave visit – to Pieropan – was undoubtedly the highlight of this portion of our Veneto visit. Four generations of the Pieropan family have been producing pace-setting wines from their 1470s building, both home and winery, within the town walls of Soave. Their production is small – they have 40 hectares of Soave Classico vines, a mere drop in the sea of Soave, as Andrea, great-grandson of the founder of the winery, told us: 95% of Soave is produced by a co-op, itself one of the largest wine firms in Europe. Pieropan does everything within the family, from growing the grapes to selling the wine – no consultants, no outside enologists. Their wines reflect their devotion: Each one stands at that exquisite balance point where passionate craftsmanship elides into sheer artistry. Andrea first gave us the current releases: 2016 Soave Classico (his father’s 50th vintage), 2015 Calvarino, and 2015 La Rocca. The basic wine showed brilliant acidity and lovely minerality, with a fine, beguiling – and seemingly endless – finish. The two crus – Calvarino 70% Garganega and 30% Trebbiano di Soave, La Rocca all Garganega – showed very clearly the differences of their sites. Calvarino was seductive, with wonderful balance and a persistent, mineral-inflected finish. La Rocca was more forceful, lean and muscular, with amazing elegance. Both are unquestionably world-class wines. Andrea then did a little tour de force, pouring two wines and not telling us what they were. Knowing how well Soave can age, I guessed they were of the 2006 vintage. Wrong! They turned out to be 1995 Soave Classico and 1992 Calvarino, from bottles that had been opened three days before, and they were both amazingly young and fresh, with beautiful acidity and that distinctive volcanic minerality that marks the best Soaves. These were simply extraordinary wines in every respect, and a perfect punctuation mark for our lesson in the age-worthiness of these remarkable white wines. Amarone is enjoying a surprising degree of popularity in the United States – surprising especially for a wine that many wine experts think is too big, too austere, too overpowering to match comfortably with any part of a meal except a course of strong, old cheeses. I strongly disagree. I’ve long been a proponent of Amarone: I love its heft and complexity, and I think it partners beautifully with equally hefty meats – unctuous prime rib roasts to be sure, and almost any game dish you can name, but also lamb roasts, or long-cooked braises of all sorts, as well as any number of cheeses. A well-made, well-balanced Amarone has no problems with any dish that can match it in scale. We winos don’t talk very much about scale, but its importance can’t be overestimated – and it’s almost self-evident, as soon as you stop to think about it. A light wine can be as elegant, or complex, or balanced, as acidic or as tannic, as a big, full-bodied wine, but you would match it with different foods because of its size, its scale. It’s not just the meshing or counterpoint of flavors that makes a good wine-and-food match: It’s also important that, like boxers, the wine and the food belong to the same weight class. With as authoritative a wine as a great Amarone, that element of the match is crucial, lest the wine appear bullying and brutal. We’ve been very lucky here in the US in that we have for years been receiving steady supplies of some of the very best Amarones, largely from a group of producers who were not represented in the blind tasting of 2013 Amarones that climaxed my week in Verona last month. (The producers who call themselves the Amarone Families withdrew from the Consorzio a few years ago. Allegrini, Guerrieri Rizzardi, Masi, Speri, Tedeschi, Tommasi, and Zenato are the best known here.) Consequently, I had what was initially the very welcome opportunity to taste wines from more than 80 producers, most of whom were unknown to me. Additionally, many of the wines in the tasting were barrel samples, and many of those that were in bottle had either been specially bottled for this tasting or bottled only a few weeks ago. A good many simply hadn’t pulled themselves together yet. Trying to judge wines this young is always an exercise in crystal ball gazing, and it is particularly difficult to judge anything definitively about a wine as long- and slow-maturing as Amarone. We tasters weren’t even dealing with infants but, for the most part, with premature births. That said, and my expectations tempered to that reality, I was still very distressed by a lot of the wines I tasted. To put it bluntly, far too many wines tasted far too sweet to suit my expectations of Amarone. A few samples had so much sugar that I thought I had mistakenly been given a Recioto to taste. This is a serious problem. The DOCG regulations for Amarone specify that the finished wine can contain a maximum of 12 grams of residual sugar per liter. For my palate, that is already high. I checked with a few of my wine colleagues (Michael Apstein, Ed McCarthy, Mary Mulligan, Charles Scicolone) about sugar levels in Champagne, just to provide a baseline for comparison. They all agreed: 5 g/l is above the detectable level of sweetness: 12 g/l is the highest limit of Brut Champagne. So 12 g/l is moderately sweet, but a drinker’s perception of that sweetness will depend both on other factors in the wine (acids, tannins, alcohol, etc.) and subjective factors (personal tolerance of sugar, e.g.). I’m not very fond of most sweet wines, and I can’t tolerate a sweet dinner wine, so 12 g/l is really pushing the envelope for me, and I consequently found many of the Amarones in the blind tasting well above my threshold for sweetness. I don’t think I’m way off base on this, so if my palate is any reflection of what the market for Amarone wants, there are serious problems here. Amarone Acinatico. A forceful, grapey nose, followed by a big mouthful of fresh fruit. Very young but well structured. Will be excellent. Amarone Acinatico 1981. The winemaker poured this to make a point, which he did indeed. A big, soft, delicious wine, marked by mushroom and earth flavors and great depth. It kept changing in the glass, getting even richer as it opened – as great Amarone always does. Amarone Cusianus 2011. A big, well-balanced wine, with excellent fruit, maturing exactly as it should. Amarone. Tobacco, black pepper, and dark fruit in the nose and on the palate, coming together in a fairly classic way. Amarone Valpantena. Very closed on the palate, but the absolutely classic aromas and finish indicate it will be fine. Bertani is, of course, one of the pioneers of Amarone, and its older vintages are benchmarks for Amarone ageability. Amarone San Giorgio. A still closed barrel sample, but like the Bertani wine, the nose and finish promise excellent future development. Amarone 2012. An almost smoky, grapey nose; tobacco and berry palate; balanced, while still forceful and elegant. Aged 30 months in big old barrels (botti). Very traditional, very fine. Amarone Tenuta Cajò. Classic, dry Amarone nose, big fruity finish. Another fairly tight sample, but showing the proper signs: should pull together and start opening in a year. Amarone Punta Tolotti. Needs lots of time to pull together its rich components – tobacco, tar, mushrooms, mineral, black fruits – but in a year it should start to be wonderful. Amarone L’Amarone. Tobacco, pepper, and earth, both in the aromas and on the palate; long finishing. Very characteristic and promising. Amarone Valmezzane. Fruity, peppery nose, lightish on palate. Still coming together, but should be fine. Amarone Monte Danieli. Despite being a barrel sample, this wine impressed me as very correctly made and properly developing. It needs time, but should be fine. Amarone. Very like the preceding wine. Still slightly closed, but showing all the right signs in nose and finish. Amarone. Cherry and tannin all through. Big, fresh, and structured. It seems likely to develop very well. Amarone 2011. A classic Amarone – very soft on the palate, with lots of fruit and lots of structure. The tail is still tannic, but it will soften in a year or so. Amarone Riserva Octavius 2010. A huge wine, with an intense stemmy/tobacco nose; round in the mouth, with loads of soft tannins, smoky cherry, tobacco, and hints of chocolate. Still young, but balanced, on a big scale. Amarone 2012. Very young, with tons of fruit and tannins, plus excellent minerality and nice acidity. Needs lots of time: The producer says to give it five years. Amarone 2011. Just lovely – austere and rich at the same time. Structured to go on for years. A fine traditional Amarone. Amarone Corte Bra 2006. At 10 years old, this classic Amarone was just entering maturity. Perfectly balanced, it felt light on the palate despite its rich fruit and impressive structure. Just fine. I’m facing a period of prolonged travel – some of it vacation, some of it business, all of it pleasurable – but I won’t be able to put up these posts with my usual regularity. So please bear with me while I’m on the road. The tales of my Campanian adventures will be continued in about two weeks. There will be no new posts on this site until power is restored to lower Manhattan. I won’t be putting up a new post for a few days. Maddening glitches in my email, unsolvable by the goblins of AT&T and completely unintelligible to someone of my generation, have forced me to change my internet carrier. This process, which to my medieval imagination should be next to instantaneous — how long does it take, after all, to sharpen a quill pen? — will apparently demand a large number (To Be Determined) of business days. Hmmph! During this enforced vacation I will be conscientiously working at future posts. Honest. I promise. I am on vacation this week, off eating some of these luscious pizzas in their ancient homeland. 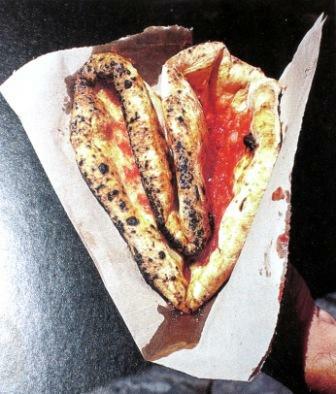 The photo is from Carla Capalbo’s wonderful The Food and Wine Guide to Naples and Campania, a cornucopia of information that no gastronome of any pretensions whatever – and certainly no traveler in southern Italy – should be without. My next post will come up on April 26. Our cookbook now in digital version. Click on the image. “Grappa: The Quintessential Italian," Decanter, Italy 2012.